Aero India 2019 dazzled when indigenously developed Tejas rose to the sky, thundering amidst the much hyped Rafale and staple warhorse Sukhoi. 20th February 2019 is a significant day in the journey of Light Combat Aircraft Tejas MK I for Indian Air Force (IAF), when the formal declaration of Final Operational Clearance (FOC) of the aircraft was made by Secretary Defence R&D and Chairman DRDO Dr G Satheesh Reddy. The day also witnessed the handing over of FOC Certificate and Release to Service Document (RSD) to the Chief of Air Staff in the presence of Defence Secretary and CMD, HAL. HAL the final integrator of India's home grown Tejas has been in storm for delaying the delivery of the Tejas, sighting the delays in getting FOC as an critical impediment. HAL will be delivering the total 16 Tejas by March 2019. FOC involves addition of key capabilities to the Initial Operational Clearance (IOC) aircraft which in main are Beyond Visual Range Missile capabilities. Air-to-Air Refuelling, Air-to-Ground FOC earmarked weapons and general flight envelope expansion. This edition of Aero India, for the first time, combines the defence and civil aviation segments into a holistic event with the co-involvement of the defence and civil aviation ministries in the event. More than 600 Indian Companies and 200 Foreign Companies are participating and witnessing the largest Air show of Asia. The inaugural address was followed by three Mi-17 V-5 helicopters flying past the dais in ‘Vic’ formation carrying the Indian tricolour, the Air Force ensign and the Aero India flag. The air display commenced with a solitary vintage Dakota flying by the stands. Thereafter a host of indigenously manufactured helicopters including the LUH, ALH Mk III and IV and LCH filled the skies with their jet wash. This followed by three ALH Mk IV (Rudra) in a ‘Vic’ formation. Following the fly past by the indigenous Dornier 228 flanked by the Hawk-i and HTT-40, came the Sukhoi flanked by LCA Tejas and Jaguar in the Missing man Formation as a homage to Wg Cdr Sahil Gandhi who lost his life in a fatal air collision yesterday during a practice sortie of the Surya Kiran Aerobatic Team. This was followed by the fighters thundering over the grandstand through the skies displaying a host of aerobatic manoeuvres – the Su 30 MKI followed by indigenous Tejas LCA, the American F-16 Falcon and the French Rafale. A host of helicopters including the LUH, LCH, ALH Mk-IV and the Sarang helicopter display team enthralled the spectators with their performance. 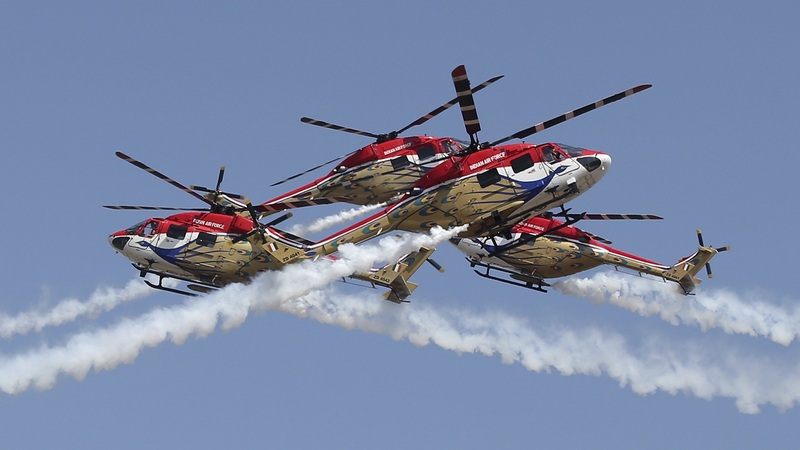 Enthralling stunts were performed by Sarang aerobatics teams with daredevil crosses and spins, that has been the mainstay of the Aero India for many editions. 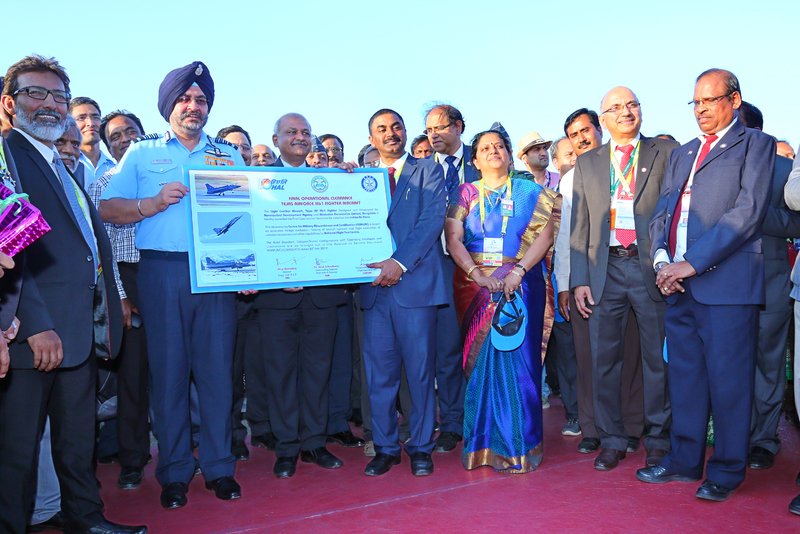 During her inaugural address Smt Nirmala Sitharaman said that this edition of Aero India intended and endeavoured to put India on the Global map and intended metaphorically to be a “Runway to a billion opportunities”! Talking about Defence procurements, Defence Minister added that during the last four years, 150 contracts worth Rs 1,27,500 Cr had been signed with Indian vendors for procurement of defence equipment for the Armed forces. She also mentioned that the Government had accorded AoN to 164 proposals worth Rs 2,79,950 Cr under ‘Buy and Make” categories only to the Indian vendors. She mentioned that the FDI policy had been revised and now foreign investments upto 49% were allowed through the automatic route and above 49% under Government route. She also mentioned that in last four years, six companies in Defence and Aerospace sectors had obtained government approval for FDI of Rs 237 Cr while FDI of over Rs 200 Cr had been received through the automatic route. The finale started with an air display by Airbus 330 Neo followed by a grand flyby by the majestic B-52 Bombers of 1950 vintage. A total of 61 aircraft are participating in the event out of which 31 are flying.